Home Uncategorized Get a Copy of My Dining Out eBook for FREE for the Next 48 Hours! Get a Copy of My Dining Out eBook for FREE for the Next 48 Hours! **Thank you for all of your help promoting this eBook! I gave away 330 free copies! What a great turn out. If you promoted, you should have received your link to the free eBook via e-mail by now. If not, check your spam folder. I am happy to announce that my new eBook, Mom’s Dining Out Deals, is now available! First, simply blog about Mom’s Dining Out Deals, or post about it on Facebook or Twitter. Second, make sure to do this within 48 hours (the ending time for this offer is Tuesday, February 14th at 7 a.m. CST). Third, you must come back here and leave a comment with the link to your blog post or post on Twitter and Facebook where you shared that the eBook is now available. That is it. Follow the three steps above, and I will give you a free copy of the eBook. If you like the eBook, consider joining the affiliate program and receiving 50% of every sale your affiliate link generates. Not only can you get the eBook for free and learn new ways to save money when dining out, but you could earn money when others buy the eBook! Would you like to spend 25% to 50% less every time you dine out? The one time $5 purchase of this eBook can save you money month in and month out. If you are a family of 4 that goes out to eat twice a month and pays $40 each time you go out, instead of paying $1,040 to dine out over the course of a year, you could reduce your costs by $200 to $500 a year! Not just for one year, but for every year your family eats out. Think of the long-term savings that are possible with the simple purchase of this eBook. 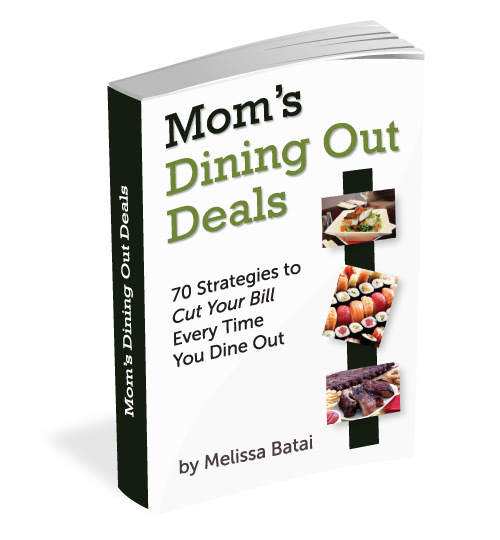 Mom’s Dining Out Deals: 70 Strategies to Cut Your Bill Every Time You Dine Out offers 48 pages of information on how to cut your dining out bill from coupon books, deal sites and ordering techniques. Mom’s Dining Out Deals shows you strategies to cut your dining out bill so you and your family can fit eating out into the budget again. Save even if you aren’t a couponer! I found this dining out eBook to be full of specific, creative, and useful tips and tricks to include dining out in your lifestyle even on a limited budget. By combining the ideas found in this guide, such as using a buy one, get one free coupon while at a restaurant that offered free kid meals, my family of four went out for dinner for under $20! We even had enough left over for lunch the next day! I would recommend this eBook to anyone looking to enjoy eat out without putting a dent in your wallet. This eBook shares 70 ways to save on dining out. It goes beyond telling you to use coupons or take advantage of social media sites (although those methods are included). You are sure to learn new techniques for dining out. The book had great ideas–especially for those of you who are new to finding ways to get great deals at restaurants. Melissa’s book provides sound advice, tips and tricks for making the most of your dining out budget. It’s not easy to stretch a dollar at most restaurants, but with Melissa’s well-researched and tested methods, you’ll be able to save at even an expensive restaurant! The resources can be applied to every family size and every income level. If you’re interested in learning how to dine out on less, this book is the place to start! I hope you will share the news that this book is available and offers real strategies for families looking to save money when dining out, and I hope you enjoy it and learn from it yourself. Thank you for all of your support through this long process! Hi Melissa, I shared your ebook on Facebook. It’s up on Facebook and Twitter now. Once I’m done reading it, I’ll review it on my site. I’d also be interested in being an affiliate. Great, Edward. Let me know if you have any problems signing up as an affiliate. Thanks! Hi there! I shared on my Facebook today at http://www.facebook.com/lesley.hensell. Congrats on your book! You are an inspiration! Shared that the eBook is available, on my Facebook account. So glad you have your book complete Melissa! You have been working so hard on it that getting it done must be a huge relief! I shared it on Facebook too. I’m posting about this in my weekly links post. I tweeted and posted your link on facebook, but not sure how to copy and paste the link here….https://www.facebook.com/PrincessPeanutsMommy maybe this will work? Thanks for posting this offer!! Hi! I shared about your book on my blog. Congrats on the book!! Hi! I shared about the ebook in Twitter and Facebook. Shared on Facebook! And I’d be interested in being an affiliate! Shared on Pinterest on ‘Books to read’ and Facebook. Did it! And you encouraged me to start something new! Congrats. I shared this on Twitter. I shared your book on my FB page…can’t WAIT to read it. I shared about the book on facebook. Thank you! Not sure if I linked to the post correctly but I shared on Facebook! Hi Melissa I look forward to reading your book! Shared the link on my facebook today. I shared this on FB. Would love have a copy of the book. I blogged about it. It will also post to Facebook and Twitter. I can’t wait to get this free ebook from you and start reading. Just shared on my facebook. So love hearing how others save and eating out is one thing I’d like to do more of again! Your book looks awesome! Can’t wait to read it! Hello! I shared about your new book on twitter. This looks like a wonderful book! Shared on Facebook! 🙂 Excited to read about all the ways to save – my hubby loves to eat out! I tweeted for you @JoshJames21…here is the link! Hi! I shared this book on Facebook. Thank you very much. I just blogged about it! Thanks! Thanks, Melissa. I posted a link on Facebook. Looking forward to reading your great tips. I shared your site and the link to this on my facebook page! Can’t wait to read the book, you are awesome! shared on facebook, can’t wait to read it. Don’t know how to put the link to my page on here. I have shared info about your book on Facebook. I’m also going to write about it in a blog post shortly! Great job on the ebook…I know it will be an inspiration to so many! Hi I shared on my Facebook today. I posted the link on my Facebook page. Thank you! Super excited to get the book. Done thanks so much for the great money saving tips. not sure how to put on the link so you can check. Just posted on Twitter. I’m looking forward to reading your book. With 2 preteen children who are “too old” for the kids menu, eating out has become a major expense for us. Thanks so much! Hi! Your book looks great! I posted about it on Facebook here: https://m.facebook.com/home.php?__user=12457001#!/profile.php?__user=12457001. Excited to share this book with my friends. I’m always down for new ways to save money. Here’s my link to my facebook page showing that I shared the free link. https://www.facebook.com/dustinswifey Thank you!! Forgot to include the link with my last post! Sorry! I posted about your book! I hope that everything goes well. I have 7 kids so I KNOW I can use this book! Thank you for the offer! I shared your fabulous deal! Thank you! Shared your link and can’t wait to give this ebook a try. I have 5 kids and work a lot so this will really help out! Hi, I shared your book on Facebook! Can’t wait to read! Posted your book on facebook! Thanks for the offer, we love to eat out but are on a tight budget! I posted about your book on Facebook. It sounds great. Posted it on facebook! I am looking forward to reading it!!! Thanks! I posted about it, shared on FB & twitter. Here’s the link to my post. Posted it on facebook. With 6 kids and a one-income family I’m always looking for tips to save money!! I posted about it on my facebook page. Thank you so much! Can’t wait to read it and start saving! Shared it on Facebook- I’m always looking for ways to save $, especially when playdates are at fast food restaurants! How do we get the copy of the book? Does it come thru email? A link will be sent to you through e-mail. Thanks! I posted about your ebook on Facebook! Just shared about your book–cant wait to read it–thanks! thank you so much for this opportunity!!!! I posted on FB for all my friends to see! I shared about the book on Facebook. Can’t wait to read it! Wow, can’t wait to read this e-book! Dining out is our Achilles heel of saving money. Really looking forward to reading this book and gaining some tips! I shared your link. This book sounds really good. Thanks for sharing! Thank you for this generous opportunity! https://www.facebook.com/profile.php?id=1128920051 I posted about this book on my facebook. Looking forward to reading it. http://m.facebook.com/home.php?refid=9 I posted the link on my Facebook 🙂 really excited to read this! I shared on Face book. I posted it to Facebook (http://www.facebook.com/brock.peoples) and Twitter (@ruralarian). Looks like a great read! I shared the free e-book on my Facebook profile! I posted on FB! Thank you!! So excited for this offer! Can’t wait to see what kind of deals you have found! I have not yet learned how to copy/paste with my new kindle fire, so I’m not sure how to put a link here—? Shared on Facebook and Twitter! I love the site! I added a share to my facebook page. I posted about this book on Facebook. Hi! I shared this entire article on my facebook page. I can’t wait to read it. I feel we can all use any help we can get! As a missionary mom ion a budget this is great! @TheseThreeKings: Want to save on date nights or the nights your family eat out? Here is a great resource! I hate to cook and hate even more to clean up afterwards so we eat out a lot. Can’t wait to read your book and see how we can continue without breaking the bank! Hi Melissa, I shared your link on my facebook page, but I’m not sure you will be able to see it because of my security settings. Congratulations on finally getting this goal accomplished…sounds great! I did post about it on my facebook page – http://www.facebook.com/profile.php?id=591784812 Will look at the affiliate link once I get my blog up & running! Posted on my facebook. Great looking book! Mom’s Dining Out Deals is full of money saving ideas! Just shared your link to your book on Facebook. Thanks! I posted on FB & I’m so exicted that you wrote this to help people out to save money while dining out. Thanks for your hard work. This ebook really does look amazing. I Tweeted about it! I tweeted about your book! Looking forward to my copy! The author of $5 dinners is offering an amazing deal to readers. You can get her new Ebook FREE. Go to this site and check it out. Melissa I shared this on my facebook page. Thank you so much for all that you do. It has made dinners at my house easier. I would love to have your Ebook and was so excited to see that you made it free for all of us. I am happy to announce that my new eBook, Mom’s Dining Out Deals, is now available! Because my readers have heard me talk about my progress and supported me along the way, I am offering it to you for free. I shared it on my facebook wall!! I shared it on Facebook! Can’t wait to read and apply your tips! shared this on my fb wall. Thank u.
I shared it on my facebook account: Thank you Melissa. Enjoyed browsing your site and shared your ebook on FB! I shared on Facebook…thanks so much!! I shared the information on my facebook but I do not know how to “link” it here. 🙁 Hope I still get the free book. I shared the link on my Homeschooling Freebies FB group. Shared it on facebook but couldn’t figure out the link. So i did it on twitter to! Not sure if I am doing this right but here goes…. I posted on FB & I’m so exicted that you wrote this to help people out to save money while dining out. Thanks for your hard work. I posted again because I wasn’t sure it worked. Sorry if it posted twice. I shared this on our Facebook page! Hi Melissa! I shared your link on my facebook page. Your book is great and very helpful! I posted about your book on my FB page. I hope someone chooses to buy this for me…or you can just give it to me for free. We have cited your blog many times on our Facebook page as well as pinterest! Love, love, love you! Hi there. I shared on FB. The reviews look great, as much as we eat out, this will be a great source of information! Thank you! Shared on Facebook Thank you for this offer!! I can definitely benefit from this book and know many of my friends & family can, too! I’m sharing the link on my facebook page! 🙂 Thanks for the offer!! http://www.413sparrowlane.com/2012/02/free-e-book-offer.html I shared your e-book here on my blog! I can’t wait to read it! Thank you for being so generous! I could definitely benefit from the info in this book and know many of my friends & family could, too! I shared the link on my facebook page… 🙂 Thanks for the offer!! I shared on my blog and on FB too. I shared it on my facebook 🙂 Thanks!! I shared your book on Facebook!! I posted on FB, excited to read your book! I posted on facebook, but I’m not sure if you can see it with my privacy settings. What a great opportunity – looking forward to reading it! Left a link and comment on my facebook page.